Hey Elites, It's definitely been a while! 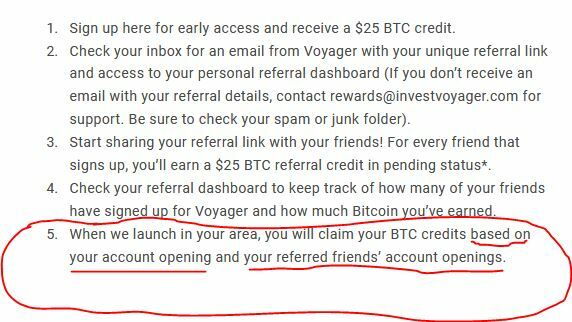 In short, here's how you can earn $25 in free Bitcoin, and this is the easiest $25 that you'll ever get. Whether if you want to keep it in BTC, invest it or withdrawal it, or whatever you want to do, this is literally so easy. A lot of companies when they first launch, they use this method and technique as pretty much paying you to join. This company is now launching and they're giving away free BTC, and it's $25 free BTC for you to do whatever with. What's cool is once you claim it, you can also refer other people to get $25 BTC for free too. All you have to do is go to the link above, and claim your free $25 BTC. The rest is pretty much common sense. If you have any questions, feel free to ask. I didn't notice that it was just for US. What did it say when you went to the link? and who knows what the stipulations of creating those accounts will be to gain access to those Bitcoins. May be Per Fee accounts. and they don't have to disclose that as a stipulation YET, because it is Separate from this Referral campaign. and when they say BASED ON usually means they will have different types of accounts..Like LEVELS lol.. Silver, Gold or some silly thing like that and you may have to be Gold to gain access to those coins.. NOT SAYING THIS IS THE CASE HERE BUT I WOULDN'T BE A BIT SURPRISED IF IT TURNS OUT TO BE THAT WAY.. They know most likely you're not gonna go back and contact all your referrals to see if they've created accounts..or YOU & YOUR REFERRALS have to LEVEL UP to claim the Prize..The Old Bait and Switch..again, and before you all start defending this company like you have shares in in it lol..NOT SAYING THIS IS THE CASE HERE BUT I WOULDN'T BE A BIT SURPRISED IF IT TURNS OUT TO BE THAT WAY..
All I'm saying is Don't go planning trips to the French Riviera based on the outcome of this, Lets just say I've seen a few things like this go left.. Think RIPPLN,,Just Google "RIPPLN SCAM"..Not exactly the same thing but similar Platform..Referral harvesting to Level up ! ..NOT SAYING THIS IS THE CASE HERE BUT I WOULDN'T BE A BIT SURPRISED IF IT TURNS OUT TO BE THAT WAY.. So if I sign up, I won't get anything? I'm from Canada. I think you can create the account but if you are not from the USA you cant refer people thats all. You cant even login to your account. (i tried but couldn't find anywhere how to). So i guess it turns out to be true for you mate. best of luck but " for people outside USA you can only create account and cannot be the part of their referral program"